NAMM 2015: Barely two months after it launched version 1.1 of its DAW, Bitwig is previewing the v1.2 update. 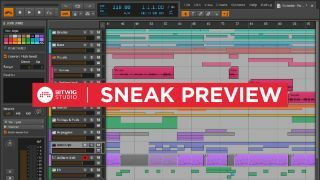 This will add group tracks, new content browsing options, an update to Bitwig's library of content, and support for high-DPI and Retina displays. Find out more in the press release below and on the Bitwig website. Bitwig Studio 1.2 will be available in beta to selected license holders in February, and additional features can be expected when the finished update is released. In our next major update you can dramatically improve the navigation of numerous tracks in every view of your project while consolidating the signal flow of multiple sources through a single Group Track. The feature introduces a new style of editing in the Arrange View called "Meta Clips." Meta Clips allow easy editing of clips from multiple tracks in group track timelines. Group Tracks also expand upon Bitwig Studio's Multi-out VST functionality, providing a convenient way to setup tracks for multi- timbral VST instruments, and useful functions to organize and consolidate your entire mix. You created the part and now you need the proper sound, groove, or melody. To accelerate the browsing workflow, all devices in Bitwig Studio 1.2 feature an Audition icon. By clicking Audition, your entire catalog of sound becomes available. Browse, audition, swap and insert anything from presets and samples to full clips of sounds during playback. Whether or not in use, the Audition Browser can be hidden completely from view to save on precious screen real estate. Bitwig Studio's advanced browsing eliminates the boundaries between devices to offer a meta view of all available sounds in one category. Searching for the right bass? It doesn't matter if it's a Polysynth preset or a sample, you now have the freedom to audition all your content in place, on the fly, to find sounds quickly and to get back to what is most important, making music. Demo songs, amazing presets, and all new sounds from Bitwig and some of the best sound designers on the planet.